Samsung just showed off its first foldable smartphone display, and while we still don't know if it'll be called the Samsung Galaxy X or Galaxy F, we did get to see the breakthrough concept in person today. Officially known as the 'Infinity Flex Display,' the smartphone concept was shown on stage for the first time at the Samsung Developer Conference in San Francisco. It was literally unveiled in shadow, with only the expandable screen lit up. We have photos of it in both forms. Anjum revealed the foldable display on stage, showing off a clamshell design with a wide interior screen when opened flat, and an outside screen when folded-up. "It’s finally here. When it’s open, it’s a tablet, offering a big screen experience," Anjum said. "When closed, it’s a phone that fits neatly inside your pocket." Is there anything else different? That's hard to judge right now. Anjum noted that the team behind the foldable phone wants to hide the details, which apparently aren't ready to be shown off in proper light just yet. However, the front screen looked pointedly smaller than the silhouette of the phone Anjum held up. We may be starting from scratch with thick bezels. That said, we're so early in development that the screen-to-body ratio could very well be reduced to the dimensions we see in smartphones today. Right now, Samsung's screen-to-body ratio on the Galaxy Note 9 is about 84%. Since glass is static and inherently inflexible, Samsung developed a new substitute: an advanced composite polymer. They also reduced the thickness of the polarizer by 45% in their quest for an ever-thinner screen. 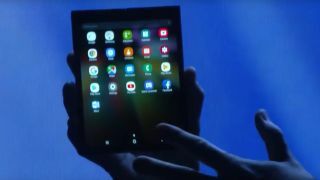 The foldable phone with the Infinity Flex Display will be able to run up to three apps simultaneously, a feature spread Samsung is calling Multi Active Window. After Anjum introduced the phone, Google's Android UX chief came onstage to announce that the operating system will work to support foldable displays in the future. This is what allows the whole screen to fold inwards, clamshell-style. Whether it can bend in other ways is unclear from Anjum's brief demonstration in the dark. But did we see the Galaxy X / Galaxy F? Samsung's 'Infinity Flex Display' is part of a phone, but the company didn't mention anything more than the foldable screen. There were no hints at the rumored Galaxy X or Galaxy F smartphone ideas that have been floated out there in recent months. Previous leaks have suggested a phone with 512GB storage and a tablet-like 7.3-inch display. There's also a wide range for the expected battery capacity, anywhere from 3,000mAh and 6,000mAh. Others suggested it had three foldable screens. which wouldn't align with what was seen on the Samsung Developer Conference stage. In any case, Samsung technically wasn't the first to show off a foldable phone. The Royole FlexPai appeared last week, with a 7.8-inch AMOLED display when unfolded and top-tier smartphone specs (including the as-yet unannounced Snapdragon 8150 chip). Of course, Samsung still has time to be the first to launch its foldable phone in the real world, maybe at CES 2019 or MWC 2019.